Thanks for the info! I am buying it right now! You beat me to it. I just saw it! Can't get it but still thanks! Wonder if there's an interview of Jim! Jim was interviewed in an exclusive video in the Vanity Fair website. I may get my hands in a copy of it but is still a small chance. 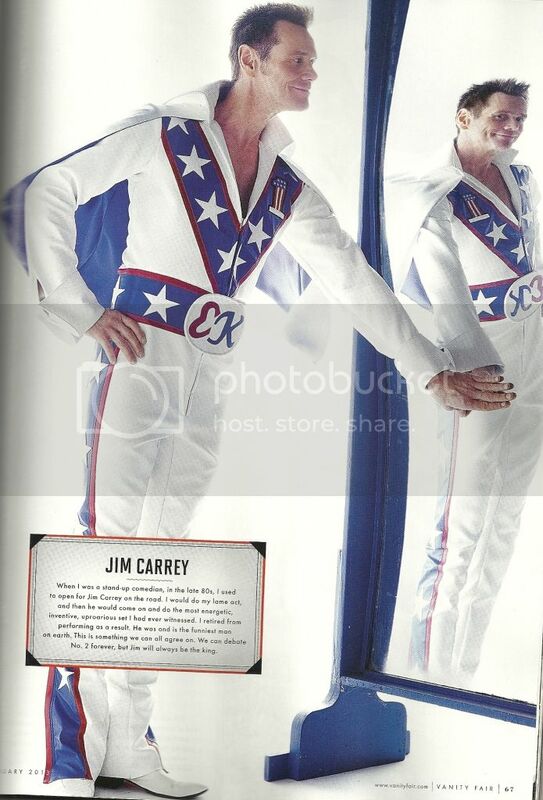 When I was a stand-up comedian, in the late 80s, I used to open for Jim Carrey on the road. I would do my lame act, and then he would come on and do the most energetic, inventive, uproarious set I had ever witnessed. I retired from performing as a result. He was and is the funniest man on earth. This is something we can all agree on. We can debate No. 2 forever, but Jim will always be the king. True, but they have finally posted some of the photos without text on their website. Fantastic photos. You mean this ones Tommy?